The Improve Customer Profitability by Cost to Serve Analysis Executive Education Short Course introduces managers to the fundamentals of Cost to Serve Analysis by creating a Customer Profitability Model, developed to help executives increase profits at their own firm. Profitability has become increasingly more important as global competition and economic stability concerns continue to increase. The highest revenue customers are often not the most profitable, and gross margin analysis may not accurately identify profitable customers either. Strategies designed without the ability to discern who is making or losing your company’s money could make your company largely unprofitable. This course was originally an add-on to the Pricing Strategy course, but by popular demand we offer this hot topic now as independent programme. The programme is comprised of two main blocks: Cost to Serve Analysis and how to differentiate between Profit Winners and Losers. Companies must be knowledgeable of the actual cost to serve individual customer requests, especially as customer demands increase. Cost-to-serve analysis is a main tool in improving a firm’s profitability. Cost-to-serve analysis will provide insight into the profitability of products, customers and routes to market. It generates a fact-based focus for decision-making for each customer, including both service mix and operational changes. A new methodology on cost and profitability, its application does not depend on a particular accounting system, so it can be applied directly after participants return from the program for the immediate improvement of their company’s profitability. 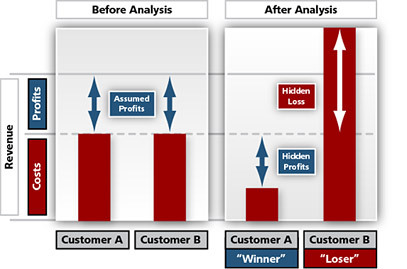 Customer profitability analysis looks past basic revenue and gross margins measurements to find hidden profits and to recoup losses. By realizing and utilizing the real costs for very single customer, your company can adjust operational and financial factors that will directly impact your profitability. This, however, does require a level of accuracy and granularity that most systems are unable to handle, since it requires data capture and analysis at the transaction level. Modelling and monetizing your business processes is essential so that your company can make smart decisions leading to profitable adjustments. This programme will provide executives with the tools to make decisions and take action. They will learn how companies can break down which customer behaviours or internal processes cost the company or negatively impact the bottom line. 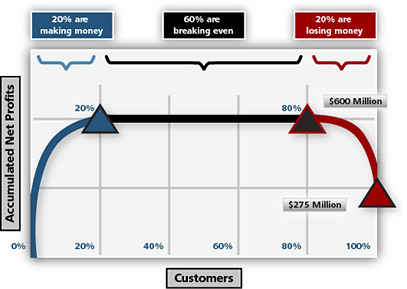 Decision line managers, by understanding customer behaviours and profit drivers, can then focus on which customers take advantage of pricing discounts, customer service, and company policies and which ones consume disproportionate amounts of resources, increase cost to serve and erode overall company profitability. Managers and executives will discover the level of detail needed to implement successful strategies. The Improve Customer Profitability by Cost to Serve Analysis executive education open enrolment short course is offered in the following countries: United Kingdom, Germany, United States, Singapore, Dubai and Hong Kong. Please click here to request a detailed brochure of the Improve Customer Profitability by Cost to Serve Analysis Programme.